How about just the briefest of glimpses of Adrian and Gillian’s wedding from TART? 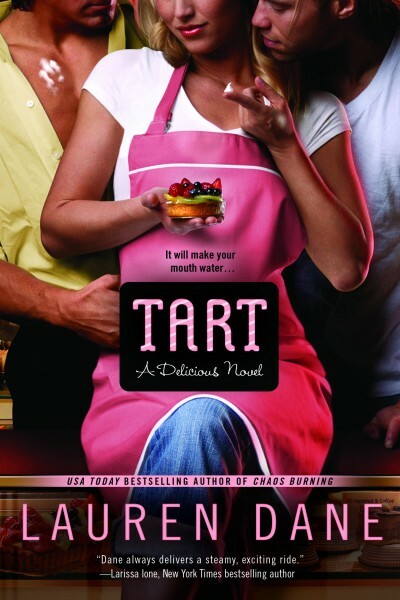 Juliet Lamprey is having the time of her life running her successful bakery, TART, when Gideon Carter comes back into her life. Returning home to help his grandfather run the family on the farm, Gideon is back for good. When they meet again, the spark between them is immediate, and it isn’t long before the former childhood friends play catch up in bed. That’s not good news for local lawyer Cal Whaley. Though the sexually open but strictly monogamous Cal has loved Jules for a long time, he’s hardly ever taken it further than friendship. When he sees her start to fall for Gideon, he knows he has to make his move or risk losing her forever. Releasing in digital formats and trade paper, November 6! Jules stepped back to look Gillian up and down. “You’re gorgeous. Oh my god.” The emotion swept through her and she found herself fighting tears. “Don’t ruin my work!” Raven called out as she finished the finishing touches on Erin’s face. Gillian’s dress was a gift from all her friends. Much like its wearer, it was classically beautiful. Elegant. Spaghetti straps with a lovely bit of beading on the bodice. The material seemed to float around her as she moved. A cathedral train so nothing too hard to manage. And in a nod to her place in life, instead of white, she went with a pale green instead. Her long, dark hair had been pinned up with roses tucked at the back. Instead of a bouquet, she’d opted for a single rose. The day that’d started off perfect had continued that way. She really couldn’t have asked for a better one for Gillian. There was a breeze and the sun had been out all day so it was still plenty warm without being too hot. The water glittered off in the distance. Music drifted up the stairs from the front lawn where the ceremony would be held. Be Sure To Visit Today’s Other Snippeters! This entry was posted on Saturday, October 20th, 2012 at 3:00 am in Uncategorized. You can feed this entry. Both comments and pings are currently closed.